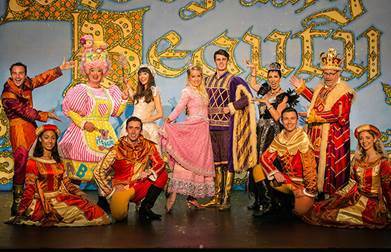 Actress and children's television presenter Rebecca Keatley may well have had the perfect preparation as she sets out to embark on a month long starring run in pantomime. For Rebecca used to be a fitness instructor before setting out on her showbiz career, and she will probably need all the stamina she can muster as she embarks on her role as Princess Moonbeam in Sleeping Beauty at the Lichfield Garrick theatre from December 1 to 31. Rebecca, who can be regularly seen on Cbeebies where she presents the hit children's TV show Let's Play, hails from the Welsh town of Port Talbot Rebecca. And it is in Wales that she was first introduced to acting when she enrolled on a BTec Performing Arts course when she was teenager, before moving to London where she trained at the Mountview Academy of Theatre Arts. Rebecca said of her performing arts course: "It was incredible and led the way into drama school, and then getting an acting agent. The rest is history really. It's definitely a challenging career and you're always on your toes, which keeps things Interesting." Her acting career has seen her appear in stage plays such as Who's Afraid of Virginia Jones, Six Wives of Timothy Leary, and a UK national tour of Jane Austen's Emma, while TV and film roles have included History Hunt for BBC 1, Jack Said, The Sabbath, and Simple Things. 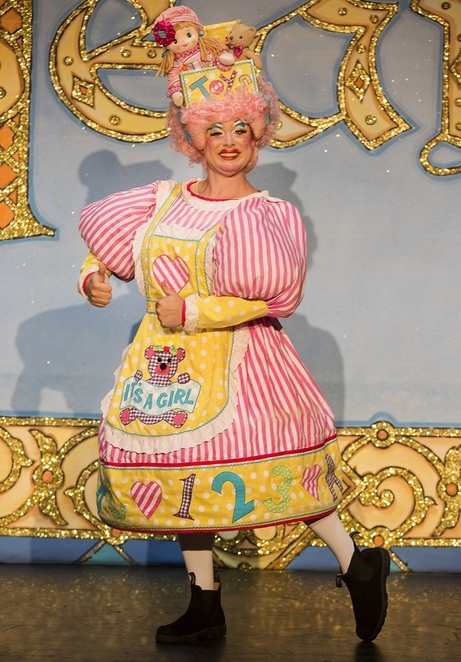 But it is her appearances on Cbeebies that most people - particularly parents of young children - will know her from, with past shows including Justins House and Swashbuckle before her current role in Let's Play. So how did children's television come out? She said: "I started to migrate into comedy and a friend saw me in a character comedy show I put on in London. He suggested I audition for the Cbeebies show 'Let's Play' which involves playing over 100 characters. I was lucky enough to get the part." So how difficult is it to pursue the two strands of acting and presenting children's television? "It's like getting any job really, you have to keep trying and putting all your energy and effort into achieving your goals. I don't really have a preference. I love to do character work but really enjoy flexing both acting and presenting muscles." Rebecca will probably be flexing both muscles when she appears in Sleeping Beauty, as she will be acting in front of large numbers of children at Lichfield Garrick. Sleeping Beauty is the fourth panto she has appeared in, so what is the attraction for her? "It's always great fun and a lovely way to spend the festive season. I'm extremely excited about performing in Sleeping Beauty. The rehearsal process has been incredible and working with such a talented cast and crew has been a dream come true. Audiences are in for a treat as the music, set and script are truly magical, witty and entertaining." And if she wasn't acting or presenting on TV? "I'd probably go back into my fitness instructing days and focus on being a yoga teacher and probably life coaching and inspiring people." 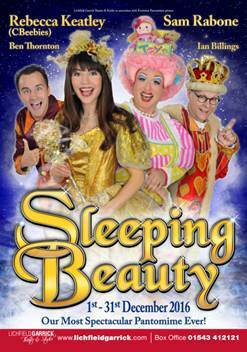 Sleeping Beauty also includes Sam Rabone as pantomime dame Nurse Nellie, children's author Ian Billings as the King, West End actress Siani Owen as Carabosse, Lloyd Davies as the Prince, Jo-anne Stevens as Sleeping Beauty, and children's entertainer Ben Thornton as Jangles the Jester, and features a fire-breathing dragon among the special effects. The panto runs at the Lichfield Garrick from Thursday 1 December to Saturday 31 December 2016, with a variety of school, matinee and evening performances This includes a signed performance for the first time on Wednesday 7 December at 1.30pm. Ticket prices start from £13 for children and £22 for adults and can be booked online or by calling the Box Office on 01543 412121. Why? You're Going To Have A Fun Time. Oh Yes You Are!